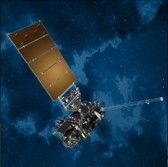 NASA has announced the launch date of a second weather satellite in the National Oceanic and Atmospheric Administration’s Geostationary Operational Environmental Satellite-R Series as March 1. GOES-S will lift off at Cape Canaveral Air Force Station’s 41st Space Launch Complex in Florida aboard an Atlas V rocket during a two-hour window opening at 5:02 p.m. Eastern time, NASA said Wednesday. The Lockheed Martin-built satellite will work to monitor weather occurrences over the western hemisphere and be renamed GOES-17 once it reaches geostationary orbit. NASA and NOAA launched the first geostationary weather satellite in November 2016 to aid weather forecasting.